Great literature not only says something about the human condition, it may also speak to the conditions of the day, thus also serving as a valuable historical text. Such examples include War and Peace, And Quiet Flows the Don, The Great Gatsby, and All Quiet on the Western Front, among a host of others. Comic books too, that quintessential American 20th Century art form, can also meet these two conditions. Our final exhibit in our examination of comic books which will still be remembered decades, if not centuries, hence, is Art Spiegelman’s Maus. 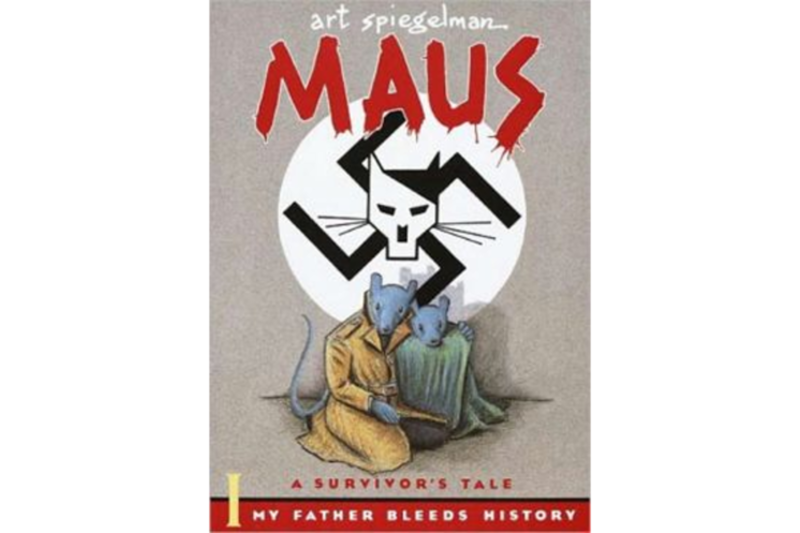 Maus documents one of the most atrocious periods of human history; in so doing, it will be remembered as a piece of comic literature that not only bears witness to man’s capacity for cruelty to his fellow men, but also to the resilience of the human spirit in enduring this cruelty. 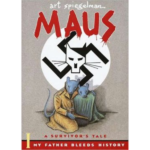 Maus is the story of Art Spiegelman’s father, Vladek, a Polish Jew, up to and during World War II, which deals with the Nazi persecution and Vladek’s attempts to cope with it in the years afterward. Couched within this narrative is the story of the artist himself: the difficult relationship he had with his father; the brother who perished during the Holocaust; and his mother’s suicide. We see Vladek, forty years later—penny-pinching and struggling with a failing heart. As Spiegelman relates his father’s experience, the reader gradually begins to admire Vladek, and to understand how the events of the Holocaust shaped him. A sample of Vladek’s ingenuity…. Jews became disenfranchised incrementally—first with the restriction of their inherent freedoms; next with the confiscation of their property; and lastly, and most grievously, with the violation of their persons. Vladek attempts to delay the inevitable. By instinct, luck, and resourcefulness, he manages to evade the Nazis and eke out food and shelter for himself and his family. But as the Germans goose step across Poland, he is eventually caught and sent off to Auschwitz. Spiegelman relates his tale using the metaphor of cats as Germans and mice as Jews, the effect of which is to soften the pure horror of the tale. Hitherto, anthropomorphic comics were funny, cute and generally reserved for kids. 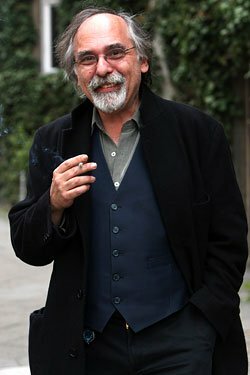 Spiegelman was not exclusive in featuring cartoon animals with human characteristics. He was, however, unique in placing them in such an unlikely setting. Readers were struck by the visual dichotomy. Here was something different. 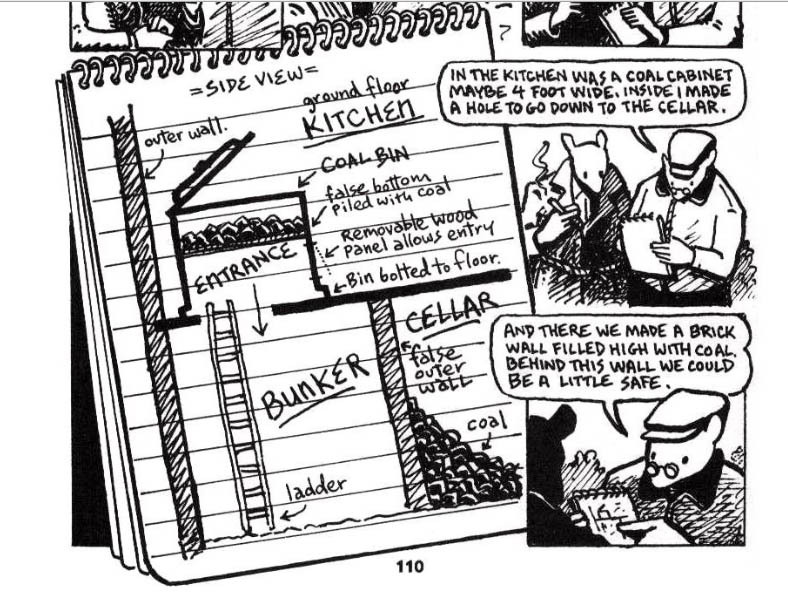 Drawn to actual size on stationary paper, Spiegelman employs simple black and white panels with cross hatching to depict the emotional horror of Vladek’s tale. Spiegelman employs inks and cross-hatching to convey the bleakness that often permeates Maus. His use of animals in place of humans creates a psychological barrier that works to shield the reader from much of the sheer horror of Vladek’s story. By 1945, it was no longer just a cat and mouse game,.. now it was cats and dogs! It was only fitting that Spielgelman should use “man’s best friend” to portray American soldiers, as seen in Maus II (1991). Though written in installments, the completed graphic novel is one of the most powerful in the field. Though not the first graphic novel, Maus made many realize that this medium was not just relegated to the world of colorful superheroes, a world for children; rather, the comic book medium could be used to speak on more serious themes. 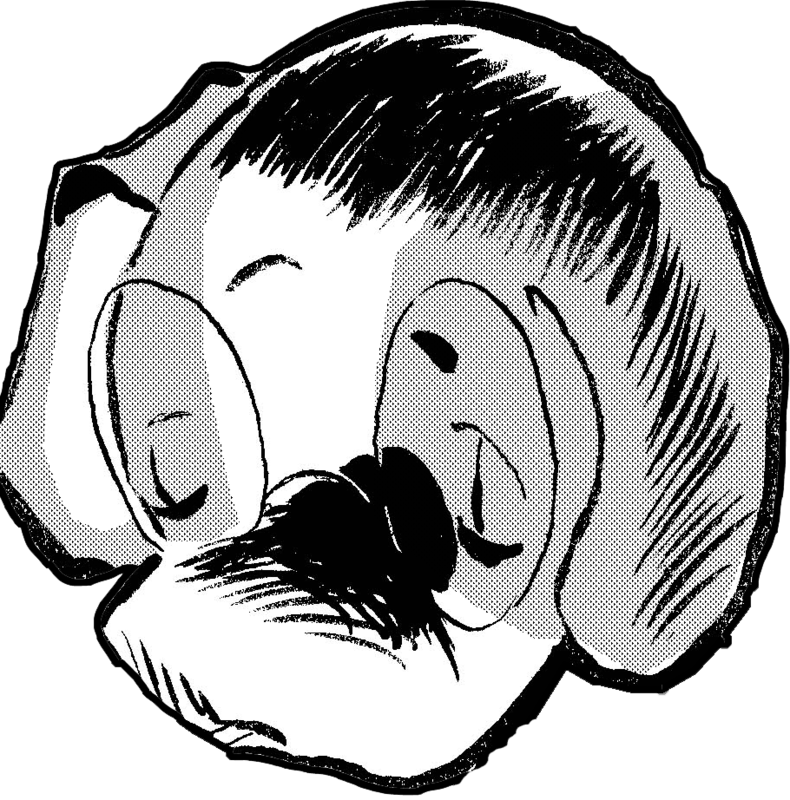 As such, Comics Journal counted Maus as the fourth greatest work of comics in the 20th century while Wizard magazine placed it as the greatest on its list of the 100 Greatest Graphic Novels. 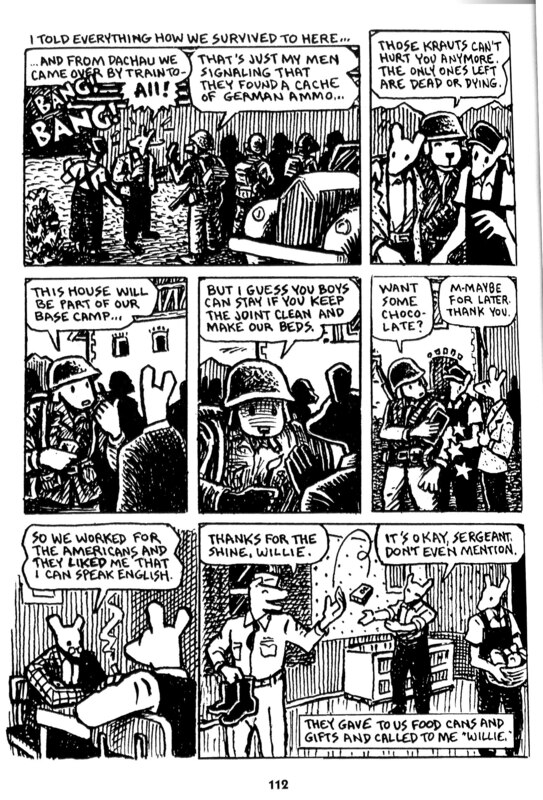 Indeed, Maus is one of the few graphic novels taught in many American college English classes as an object of literary study—a piece of literature. Harvey Kurtzman, one of Spiegelman’s influences, had a slightly different take on mice…and men. 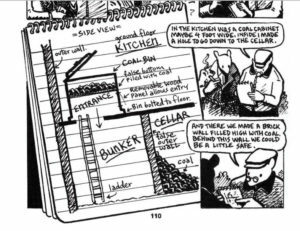 As that Mad Genius, Harvey Kurtzman (who also happened to have a great influence on Spiegelman), noted, “Grown-ups can read “Maus” and feel a respect for Spiegelman’s writing; they can read “Maus” as if they were reading a novel. 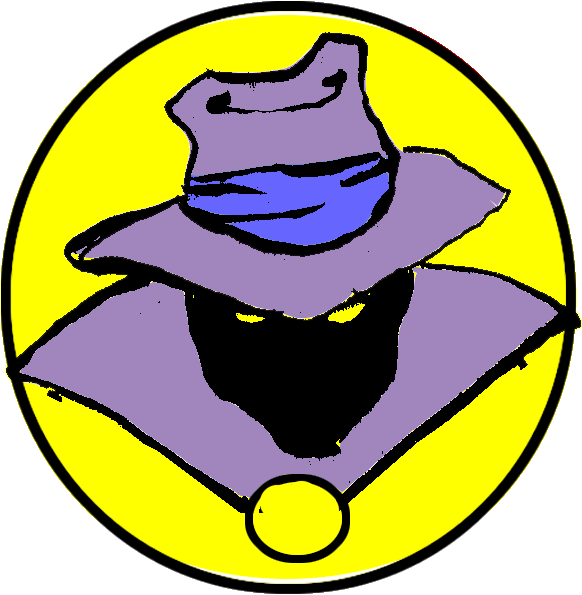 Spiegelman has opened an avenue of interest that’s a real service to the medium. . . This book once and for all established comic books as a serious form of literature.” Indeed, Maus, along with the other books profiled in this series, is already a classic and will be studied in the future just as it is today. We picked these five books as five examples of immortal comic classics, but we could easily have picked five more. What are your choices for immortal pieces of comic book literature?